Teaching robotics to elementary students can enhance sensory learning, improve socialization, provide opportunities for hands-on innovation, and raise the level of rigor. In President Obama’s final State of the Union address, he expressed the importance of “helping students learn to write computer code.” In a recent YouTube video for Code.org, Obama spoke to students, urging them to “master the tools and technology that will change just about everything.” Obama is correct. Our students must shift from being passive purveyors of technology to creators of programs, apps, and inventions. We must push them past low levels of static reception into a dynamic mindset, highlighting and nourishing thought and imagination to improve our world. The elephant in the room is the cost associated with computer science technology. Programs like Code.org, Khan Academy, and others offer a viable solution. They’re free to educators and parents, offer motivational incentives, and attract students with highly colorful graphics and relatable character interfaces, such as zombie attacks or familiar video game characters. Sites like these are the first step to introduce coding into the classroom. Robotics is the next step. 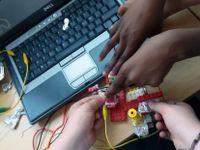 Over the past few years, the market has witnessed the rise of robotic tools—like Sphero, Wonder Workshop and Lego Mindstorms—that teach students how to code. At its core, robotics moves students away from the solitary interface of a computer screen and into an active social community. Not only does the space of the students’ world increase in size, so do the benefits that computer science has to offer. Teachers know what their students need emotionally, socially, and academically. Therefore, teachers should be properly armed to advocate for change, when needed. Here are five reasons to consider purchasing robotics for the K–12 classroom. Children learn with all of their senses, and robotics aligns more naturally with the active, hands-on development of a K–5 student. Studies have shown that a multisensory approach activates a larger number of cognitive connections. Robots like Dash and Dot from the Wonder Workshop encourage students to touch, build, measure, follow, run, and skip beside Dash as this bright blue bubble on wheels treks across a grid, avoiding obstacles or launching ping-pong balls. Students are emotionally and physically engaged, making increased neural connections that result in active learning and enhanced long-term experiential recall. Social learning is nothing new. Back in the 1970s, Albert Bandura established the most well-known theory of modern social learning, which suggested that people learn from each other through observation, imitation, and modeling. This line of thinking still holds true today. Communication and collaboration are critical skills to prepare young people for the world outside the classroom doors. Robotics challenges offer students opportunities in all forms of socialization, including (and most importantly, developing) burgeoning listening skills, and considering and evaluating alternate perspectives. By now, you’re probably wondering, “Why robotics?” While it’s possible to integrate hands-on learning and opportunities for increased socialization by other means, the third reason is critical to robotics. Daniel Pink theorizes that the 21st century has witnessed an altered mindset in the global market. In this new world, the MFA is worth more than the MBA. While computers can be programmed to attend to logical, linear outputs, creativity and innovative thinking can never be automated. This gives rise to costly implications for our students. While preparing them to calculate, spell, and recall the names and locations of states on a map, are we balancing the curriculum with opportunities to problem solve and ask the questions that bring forth innovations? Robotics challenges offer students exciting opportunities to build and express their imaginations. There is an authenticity of purpose inherent in bringing the seed of an idea to fruition, from the brainstorming phase to construction of artifacts that have real-world value. The highest levels of Bloom’s Taxonomy are application, analysis, synthesis, and evaluation. At these peak levels of thinking, students begin to consider real-world applications for knowledge. Facts and ideas become building blocks with which they can construct innovative applications, products, and inventions. Jobs in the 21st century will require our students to perform at the highest levels of thinking. Yet how often are we providing them with these opportunities? Robotics programs vary in cost, but one unifying factor is that they are generally non-consumable. This translates into valuable returns for multiple classes over subsequent years. Of course, there are typically updates that are needed, but their cost is considerably less than those related to the impact that the solitary computer experience is inflicting on our students. Chiropractors have witnessed an influx of children experiencing headaches and back, neck, and shoulder pain resulting from sedentary lifestyles and excessive use of computers. Conversely, robotics gets students up and moving, lowering associated health costs and risks. In my own elementary classroom, I’ve integrated the arts, including music and theater, into our robotics program. My third-, fourth-, and fifth-grade students participated in the Wonder Workshop: Wonder League Robotics Competition. Within the course of seven space-themed missions, they learned block coding, but beyond that, they learned to problem solve, create, innovate, and take on differing perspectives while delivering new understanding to themselves and their peers. With one glance at their video submissions, the viewer will understand the wealth of learning reaped from this experience in robotics. Their song for Mission Seven emphasizes this message. The desire to create is nothing new. A combination of hearts, minds, and bodies has always contributed to the betterment of our world. Robotics values ingenuity and the limitless possibilities of creation.